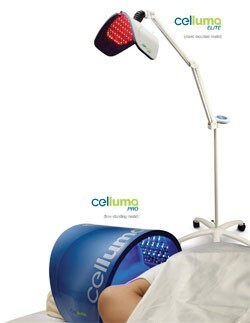 Celluma is unique quite unlike any other low-level light therapy device available today. Based on NASA research, Celluma LED Light delivers blue, red and near-infrared light energy simultaneously to safely treat a wide variety of conditions. Each wavelength is absorbed by different molecules that act as a signaling mechanism for different cellular processes. For example, some wavelengths reduce inflammation and some kill bacteria, while others enhance localized circulation. Phototherapy is known for its healing and anti-inflammatory properties and has a variety of applications across many medical fields. Research has shown that LED Light Therapy can increase circulation, accelerate tissue repair, decrease wrinkles, decrease inflammation, improve skin tone, texture and clarity, ease muscle and joint pain, stiffness, spasm and arthritis and kill acne bacteria, and much more. We offer both, Celluma Elite and PRO, providing us with a wide range of placement options for our clients. Ideally sized these devices can easily be positioned over any part of the body, including the spine, hip or shoulder complexes, feet, knees, and more. Call today to learn more about the benefits of LED Light Therapy.